A favorite of these Flatbread pizzas is the flexibility they provide to use just about any ingredients. Here, I use some butternut squash and sage to create a Fall inspired flatbread pizza, but frankly, I’ll make it all year long. The sweet butternut squash is sliced thin, and then roasted in oven until just tender. I also fry the sage leaves, which both brings out their flavor, and gives them an awesome crunchy texture. 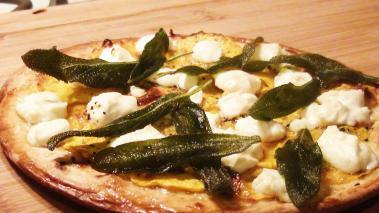 Finally, holding it all together, I use a bit of goat cheese which provides a great creaminess to the pizza and a tangy bite that offsets the butternut squash. It’s a perfect combination. Hope you enjoy it! Finally, as with frying anything, be careful with the Sage. Only fill the pan up half way, to ensure the oil doesn’t spill. There are a number of good wine pairings with this pizza. If I’m trying to keep it light, I’d probably go with a dry Riesling or Gewurztraminer. But a quite floral and will work nicely with the squash. If you’re looking for something more substantial, you may want to try a Oregon/Washington State Pinot Noir, which tend to be higher in acid than California pinots.